Although a geographically and culturally separate entity from Italy, after unification all of Italy was ruled under the Kingdom of Sardinia and it is from here, the most ancient region of Italy, that the Risorgimento album begins. “Cantu” is Sardinian for canto meaning “song,” “singing,” or “I sing”. This song is written in the ancient polyphonic vocal tradition of Sardinia knows as Canto a tenore, and is the only song on my record using lyrics from another source: Sardinian Nobel Prize winning poet Grazia Deledda (1871-1936). The poem used in this song, “America e Sardigna,” was written in 1893 by Deledda in her native Sardinian language, which is one of the most ancient Latin based languages. Deledda’s depicts the harsh realities of living in an isolated region, but also the love for her land and its people, identity, diversity, unity, and freedom. In the first line of “America e Sardigna,” Deledda raises the issue of language which Italians, refer to as la questione della lingua (“the issue of language”). Deledda points out that Sardinian is rooted in the language of the Romans – retaining much of the Latin language’s ancient roots. Italy has thousands of regional languages, commonly to referred to them as dialects, but the term is considered controversial among many Italians since these languages pre-date modern Italian. In the case of Sardinia, the island was not exposed to the modern Italian language until the twentieth-century, therefore it cannot be a branch of a language it only recently discovered. It might be more accurate to refer to all regional Italian languages as dialects of Latin, including the Tuscan “dialect” of Dante, which is now standard Italian. The dialectic languages are so different from region to region that it is not uncommon for two Italians from different regions to not fully understand one another. Of the folk music coming from each region, the lexicon, phonetics, inflection, and meanings behind particular words and phrases in the dialectic language are as much a part of the musical quality as is the music itself. This Sardinian poem is an example of how different these regional languages are from standard Italian. The second line in Deledda’s poem is about the “sweet fairy tale” of her “patriotic land.” Sardinians consider their island to be more than a region: they consider it their nation. Because of its distance from mainland Italy and Sicily, Sardinia is often the forgotten land, marginalized from the rest of the penninsula and detatched from the mainland culture that most consider and define as Italian. The “sweet fairy tale” embodies strong images of a magic place but also a place whose existence – so far removed, forgotten, and undiscovered ­­­– verges on questionable. The name filumena in Deledda’s poem seems to have two meanings: for one, Saint Filomena (Philomena) is the patron saint of lost causes (stphils.com/church/about_us/patron_saint.cfm). Another meaning of filumena comes from an anonymous traditional Sardinian poem entitled “Custa Filumena in Cantu,” in which filumena, in the Italian translation, is revealed to be the Blackcap bird known for its beautiful singing. In the final lines of the “America e Sardigna” poem, Deledda writes about a boat crossing over the waters toward the “flourishing” or “flowering” America. The New World was long ago discovered by Europeans, but unlike America, or even mainland Italy, Sardinia in 1893 was still uncharted territory. Deledda implores filumena, the Blackcap bird, to tell everyone in America that Sardinia is there, and still waiting to be discovered. It is not overt, yet it might not be ruled out that issues of gender and career could be read into the lines of “America e Sardigna” as well. At the time Deledda wrote the poem, she was twenty-two years old. Her only formal education ended after elementary school but she continued to learn through tutoring from a relative and later with her own pursuit of literature. Deledda wrote the poem early on in her career and the recognition she received was to come later in life. In my interpretation of the poem, Sardinia is a symbol of being marginalized or even invisible, not only as nation to a continent, or an island to a nation, but also as a woman and female artist. Musically, I have taken inspiration from the ancient polyphonic singing of the canto a tenore: a style of singing that dates back to pre-Christian times. The style is of tertiary chords sung by three voices that support an upper melody line. The chords shift up and down in parallel major or minor seconds with the vocal line above locking into the shifting accompaniment. Two of the three accompanying voices use a guttural singing technique also known as “throat singing” or “overtone singing” that produces whistle tones above the sung pitches. The three voices that support the melody line do not sing lyrics but sing instead nonsensical syllables like “bem bim bo” which are meant to imitate the sounds of nature. The result is a primitive sounding chant of a rural prehistoric age before language and complex harmony. The soloist is called the oche (“voce” – voice) and does not sing in the guttural style. The soloist sings poetic texts on various themes from the sacred to the profane in Sardinian. The soloist may also incorporate variations and ornaments to the vocal line that may derive from different regional traditions, categories of song style, or the ability of the oche soloist. The highest accompanying voice is the mesu oche (“half voice” – mezza voce) and sings the tonic an octave higher than the bassu. This voice does not sing in the guttural style and therefore does not produce overtone notes. According to Sardinian legend, the mesu oche is supposed to embody the sound of wind. The contra (contralto) sings a fifth (or sometimes the third above the bassu) in the guttural style with a more linear line and with less vibrato than the other voices. The contra represents the sound of bleating sheep. The lowest voice is the bassu (bass), which sings the root of the chord. The bassu sings using the guttural throat singing technique allowing higher pitched overtones into his musical line. The bassu represents the sound of a cow lowing. 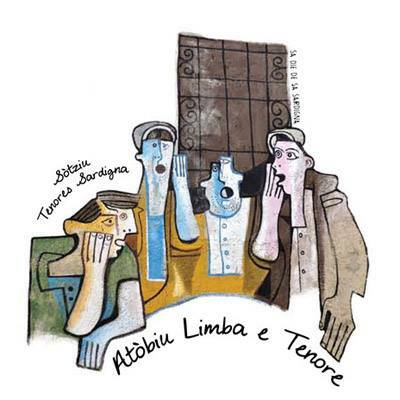 In 2005, UNESCO recognized the Sardinian Tenore song as one of the Masterpieces of the Oral and Intangible Heritage. One of the groups most famous for singing in the tenores style (meaning “choral” style) is the Tenores di Bitti, from Bitti, Sardinia. Bitti is in the province of Nuoro: a region with a long history of canto a tenore singing. Although today’s groups are exclusively made up of male singers, in ancient Sardinia this chant-like tradition was known also as a matriarchal one (classicalvalues.com/2010/07/cantu_a_tenore/). With this in mind, the “Cantu” composition was approached using all female voices but without guttural singing. From Eb, Bb, Eb the chord shifts one semitone down to D, A, D in measure nine. At measure thirteen the chord moves one full-tone up to E, B, E plus melody. And at measure seventeen, the piece modulates a semitone down to Eb, Bb, Eb plus melody, returning to the original tonal centre. The melody is improvised above the shifting chords. With men’s art defining so much of Italian, European, and world culture, featuring a female poet in a female tenore piece is my chosen starting point for the “Risorgimento” journey.